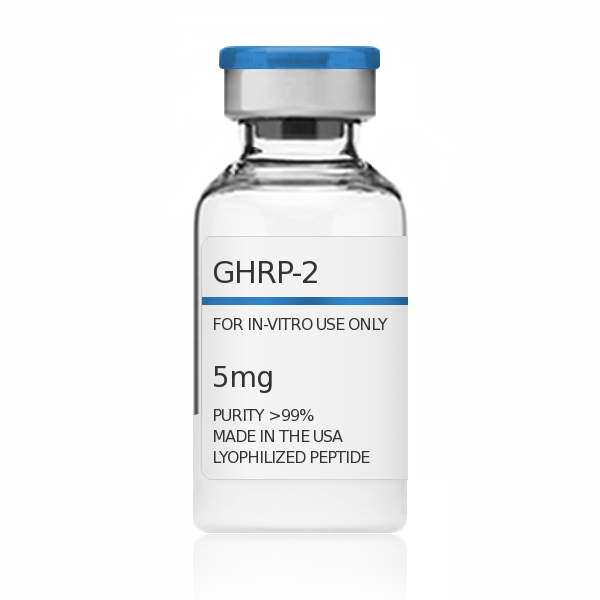 GHRP-2 (Growth Hormone Releasing Peptide-2) is a single, non-glycosylated synthetic met-enkephalin analogue. GH-releasing peptides (GHRPs) are synthetic peptides that, like GHRH, act directly on pituitary somatotrophs to stimulate GH release. Ghrelin has been shown to have two major effects, stimulating both GH secretion and appetite/meal initiation. GHRP-2 has been extensively studied for its utility as a growth hormone secretagogue (GHS). GHRP-2 may stimulate GH secretion and elevate IGF-I levels more than any other single peptide. Further studies have suggested that GHRP may have anti-inflammatory effects in mice. It is important to know that GHRP-2 does not relate to any GHRH peptides such as Sermorelin as it acts on different receptors. GHPeptides™ GHRP-2 has a peptide purity level that exceeds 99.0% as determined by HPLC. This peptide was synthesized with no additives and is supplied as a white lyophilized (freeze-dried) powder. It is recommended to reconstitute the lyophilized GHRP-2 in sterile water, which can then be further diluted in other aqueous solutions. Lyophilized GHRP-2 although stable at room temperature for 3-4 weeks, should be stored desiccated below -18°C. Upon reconstitution, GHRP-2 should be stored at 4°C out of direct light for between 10-14 days and for future use below -18°C. Prevent repeated freeze-thaw cycles.